Decision Making is probably the most neglected section when it comes to XAT preparation. A lot of students pick it up once they are done with all the other MBA entrance exams like IIFT / CAT / SNAP. As a matter of fact, if you are reading this post – probably you are in that category as well. The good part is that there is still enough time left to prepare well for XAT Decision Making. One of the most common problems that students face with XAT Decision Making is that they do not get enough questions to practice. Even if they get the questions, they do not get reliable answers for it. As a part of our online course for XAT Decision Making, we not only provide 100 new practice questions but we also provide detailed video solutions for all previous year XAT Decision Making questions. Given below is a set of 20 new practice questions for XAT Decision Making. Hope they will help you prepare for the exam. You will know the answers at the end of the quiz. This mock test is a part of our online coaching course for XAT DM. Given below is a set of 20 new practice questions for XAT Decision Making. Hope they will help you prepare for the exam. The answers and detailed solutions will be sent to you if you fill up the answer sheet given below. 1. Maninder was an operations manager in a social development organization and observed deep-set caste discrimination all around him. Observing that caste based discrimination was endemic in his organization, he decided to quit and start his own NGO. In his organization, he employed people from all castes and tried to eliminate caste-bias. Over the years, his NGO expanded and started working with various sections of society and started supplying material to organizations dominated by those of supposedly higher castes. As part of his team, he built a squad of sales representatives consisting of people from diverse backgrounds and all castes. As his representatives were from diverse backgrounds, including the lower castes, he soon started experiencing resistance from his clients as they objected to the presence of representatives from the lower castes. Maninder is stuck in an ethical dilemma now. With more than half his employees from the lower castes, he can no longer send them to his clients. He is under pressure to change the demography of his organization. On the other hand, if he does so, he defeats the very purpose of building his organization in the first place. What should he do as a socially aware entrepreneur who knows his social responsibilities? A. Shift to businesses and areas of work which face no such stigma. B. Reduce the number of lower-caste employees. C. Let the current situation continue and hope for the social climate to improve. D. In future, hire only people from castes that pose no such problems. E. Try to juggle his assignments in such a manner that he does not send people from the lower castes to those clients who object. 2. You are the HR manager of a newly established-BPO and are on the lookout for talented and hard-working people who can serve on the team. One of the applicants is Udit, an engineering graduate from a mid-level institute but comes from an impoverished background. Because of this, his communication skills are not quite up to the mark and you are in two minds whether to hire him or not. As far as his school records are concerned, they are up to the mark in all subjects, barring one, that is English. Because of the above, you are uncertain about hiring Udit and are not sure whether he would fit in the young crowd at your BPO. If you are the HR manager in concern, what would you do in the given situation? A. Explain the situation to Udit, and help him understand why you could not hire him. B. I would hire him without even it giving it a second thought case and the job itself would help him learn the art of effective communication. C. I would identify the specific role that is suitable for his skill-set and make sure his shortcomings are overcome with the right assistance and training. D. Provide him with resources that can help him improve his communication so that he can apply for other jobs at a suitable time. E. I would help him find a job in another industry that does not require any communication skill at all. 3. The premium fountain pen and diary combo industry in India generally sells around 1 million fountain pens and diary combos every year. This industry generally caters to the richest sections of society, and the price range for these combos starts from at least Rs. 6000 for a single set. In the last 10 years, the world has seen a massive change in terms of technology and we are increasingly seeing that digital products are replacing traditional items. With the coming of smart-phones, tablets and devices such as Kindle, high-end consumers have started using these devices for organizational tasks, and this has meant that the market for the premium pen and diary combos has gone not grown in the last 10 years, and in fact, is beginning to see its first signs of recession. What should be strategy adopted by the premium fountain pen and diary combo industry in order to be profitable in the long term? A. Merge with other companies in the sector and try to reduce the competition, thus reducing the price wars. B. Try to get back their lost clientele with the help of new designer pen and diary combos. C. Increase the appeal of their products by introducing a new line of cost-effective combos for middle and lower classes of society. D. Use technology-enhancement features in their products and convert them into digital diaries and pens. E. Reduce the prices of their combos to attract some of the lost clientele. 4. Being in the middle of a recession has meant that a number of areas of the economy have suffered. One area to be particularly hit is the car industry and the industry leader Suruti Muzuki has seen a drop of 15% in its sales. In order to cope up with the situation, Suruti Muzuki has to come up with a plan to beat this downswing in the whole sector itself. Suruti Muzuki has been traditionally a brand that has catered to the middle segment of the market by providing cars with great fuel efficiency and ones that generally low on frills. Being a part of the company board, which out of the following would you recommend as a course of action to recover some of the lost revenue of the company in the current fiscal year? A. Reduce the operating costs of the company by reducing the staff. B. Increasing the advertising expenditure of the company so as to increase brand awareness. C. Using an enhanced loyalty and exchange bonus schemes that help drive up the sales. D. Downgrading the current variants so that their price reduces. E. Innovate and create a new car that becomes the cheapest car available in the market. 5. You are part of the government infrastructure committee that came up with a plan to remove slums from the heart of the city and provide with slum-dwellers with low-cost housing in peripheral areas of the town. The scheme received due approval from the slum-dwellers at the time and was welcomed as it provided them with a better homes than their existing accommodations. The initial draft of the scheme as floated in the year 2005, and on the basis of the census of the slums in the year 2009, the construction of the low-cost housing began in the year 2010 and was completed in 2013. Now the stage has arrived where people need to be removed from the slums and re-located to the new areas. Because the scheme, from the time of the census to that of occupation of the houses, took 5 years, there has been an influx of new individuals in these slum areas and they are not willing to vacate these areas. Which, out of the following, is a solution that you should put up in front of the committee? A. The slums need to be vacated at all costs and the individuals not co-operating should be forcibly removed. B. New houses need to be created for the new migrants and they should be allowed to stay in the slum areas till the time the new houses come-up. C. Since the scheme had a cut-off date, individuals who occupied the slums after the given date should be given provisional shelter so that they can find alternates for survival. D. The slums should not be emptied and can acts as future source of accommodation for all those arrive in the society. E. The slums itself should be converted into low-cost housing, thus providing the city with enhanced facilities to house all those who arrive in the city. Answer question nos. 6 – 10 on the basis of the information given in the following case. Rahul has the task of finalizing the final location of the new distillery. In order to finalize the location, he has to complete the following: a preliminary assessment of the project by a consulting group, the costing involved in various locations in setting up the project, the feasibility of launching such a project in the current scenario, the status of TCYs competitors and their sales and the possible market size that can be captured by TCY in the near term. In order to do accomplish all of the above, he needs to build a team of the company’s best managers in the first place that can take care of all of the above. Such being the complex nature of work above, Rahul is consistently under stress as he wishes that his first assignment should be completed on time. Along with the above work-pressures, Rahul is also faced with a re-location to any of the above cities for the duration of the project, so that the process is seamless in nature. The idea of shifting to any of the above regions is being met with resistance by Rahul’s wife and this has further added to his worries. The deadlines combined with domestic pressures have meant that Rahul has not managed to fully adjust to his job and is struggling to cope with his work requirements. A. Identifying the company that would undertake the preliminary assessment of the project. B. Pacifying his wife and explaining the demands of his job to her. C. Apply for a short leave so that he can handle his domestic issues first. D. Build his team of lieutenants who are then assigned to handle the different works, thus relieving Rahul of some of the responsibilities. E. Work with the consulting group and identify the location of the new distillery first, as all other decisions would depend on the location. (i) Rahul should send a team of his own experts to carry on-ground research in two cities. (ii) Rahul should talk to his wife with respect to the city she would be comfortable with and make the final choice according to her wishes. (iii) Rahul should present the case of the two cities to the board of directors, with the final deductions about the two cities. (iv) Being the managing director of the company, Rahul should make the bold decision without any fuss and take full responsibility on his own shoulders. (v) Rahul should hire another consulting group that provides him with the city name he is looking for. 8. Which, out of the following, would weaken the need for hiring another consulting company (keep the information supplied in the previous question in mind) to arrive at the final decision? A. The final outcome in any project is hardly at variance with reports submitted by consulting companies. B. The essential details required for making a final decision can be accrued only by first-party physical research. C. The mode of research for most consulting groups focuses on industry information. D. Distilleries are part of evergreen businesses that do not require any real market research and assessment reports. E. Distilleries need to set-up in areas with maximum per-capita alcohol consumption and that is the only data required by Rahul to make the decision. 9. Rahul has arrived at the conclusion that this is not the best time to start a new distillery plant as the market forces do not seem to favorable at the time. Yet, at the back of his mind, there is the nagging doubt that since his wife is opposed to the idea of moving out of North India and has made her opinion public to some of his colleagues, his decision may not be viewed as impartial. Which, out of the following, is the best course of action that he can adopt in the given situation? A. He should excuse himself from the decision making process, even though a fair amount of time has passed, citing personal reasons. B. He should go ahead with his decision and not air his personal concerns, hoping that his colleagues do not spill the beans. C. He should not take unnecessary burden on his conscience and reveal the whole sets of facts (including his personal situation) to the board. D. He should maintain his professional standards and present his case purely on the basis of the facts and figures to justify his recommendation. E. He should take some more time before making his decision and in the meantime, ensure that each of directors understands his situation. A. Lack of transportation facilities. B. Lack of easily accessible raw materials. C.	Lack of real estate at viable rates for the development of the distillery. D.	Lack of migratory labor in the region, to be employed at the distillery. E.	Lack of an organized retail structure to sell the finished good. 11. The Vahindra MUV is a newly launched sports utility vehicle in the market with the whole gambit of accessories and value added features. One of the features added to the car is an enhanced navigation GPS system. Vahindra, after it had sold about 100000 MUVs, got to know that in some of the car’s GPS systems, the wiring has some execution flaw that leads to system failure within a few months of use. The flaw crept in because the training given to some of the electricians who fit the system was faulty. Vahindra has no way of establishing who fitted these systems in certain car and thus cannot establish the faulty vehicles amongst the whole lot. The company is now faced with a tricky situation: face the ire of its customers or risk a significant loss in reputation by making the flaw public. Which, out of the following, is the correct solution for the company? A. The company should not make the error public, and repair the ones that report the fault without charging the concerned customer. B. The company should conduct a survey amongst its customers and try to establish the ones who are facing the problem with the GPS system. C. The company should make the fault public, and at the same time, publically fire the group of electricians responsible for the flaw. D. The company should introduce a new variant of car, without any such flaws, and make sure the limelight is completely focused on this product. E. The company should recall the cars and rectify the errors, whatever maybe the consequences. 12. Quickr Airways finds itself in a peculiar circumstance. The low-cost aircraft carrier has recently experienced success with its e-commerce venture and that has meant that most of its ticketing operations have gone online. Since these processes have gone online, the staff requirements in the ticketing division have reduced significantly. At the same time, Quickr Airways is known for its employee friendly policies and is known to provide its employees a stable and secure work environment. The organization now finds itself in a dilemma of how to reduce its costs by downsizing (to account for the increasing fuel costs in the last few years) and maintain it employee-friendly nature. Which, out of the following, could be the most suitable long-term solution to the problem? A. Since the economic viability of the organization comes first, the airline should let go of its employees. B. The company should retain the best performing employees in the ticketing division and let go of the others. C. The company should start another venture where all the employees who lose their jobs can be employed. D. The company should wait for the fuel prices to decrease, so that it does not need to remove the employees, and in the meantime, bear the losses. E. The company should offer the relieved employees handsome early retirement benefits and make sure that all those relieved in the ticketing department receive adequate compensation. 13. In the last 1 year, Trust Communication, a major Indian telecom company, has seen its 2G users drop by 23%. During the same period of time, the revenue earned by the company has increased by 14% and consequently, the company has attracted significant foreign investments. This behavior of the company stock has raised speculation about the conduct of the company and most people find its performance inexplicable. Which, out of the following, accounts for a possible explanation for the increase in revenue of Trust Communication and the subsequent investments it has attracted? A. The company has successfully warded-off a takeover bid and is seen in control by all stakeholders, thus inspiring confidence in its consumers. B. The company has expanded in new territories, such as Africa, and soon hopes to reap in rewards from these areas. C. The company has increased the number of free services to its existing customers, thus rewarding them for their loyalty. D. The number of telecom companies in the last 2 years has decreased significantly, especially after the scams pertaining to 2G spectrum allocation. E. The company holds the pan-India 4G license, and has leased to these at significant premium to other telecom companies. 14. Ambalal Corporation hired a new branding and sales manager in the year 2012. The hiring was done considering the fact that the retail clothing market has seen a dip of 10% in the last one year and something needed to be done, and the person concerned has stellar record in the field of sales and marketing. In the last one year, Ambalal have declined by 5%, and considering the fact that market has continued to underperform in the year 2013, the results are along expected lines. Out of the following, which would be the best course of action for the branding and sales manager in the upcoming board meeting? A. Considering the market dipped by double digit numbers and Ambalal faced only a single digit loss, the manager can take credit for the situation. B. Since the manager has not managed to increase the sales figures, he should resign from his post and make way for someone else. C. Since the market has performed badly, and Ambalal has managed to hang in, the manager should ask for another chance to prove his mettle. D. Since a number of companies do well even in declining markets, the manager has not performed up to mark and should be forced to leave. E. The manager should highlight the current sales scenario, come up with a plan for the next year keeping the cost in mind, and leave it to the board to decide the future outcome. 15. There is a new fuel additive ‘Elixir’ that can be mixed with petrol and can improve fuel efficiency of vehicles by 50%. This additive only increases petrol cost by about 10% and can be readily derived from some natural sources. Despite its success, majority of the oil marketing companies has not providing fuel pre-mixed with this additive and thereby are missing out on a chance of using the already limited petrol resources for a lot longer. Which of the following statements explains the approach adopted by oil-marketing companies? A. Majority of the oil companies do not have necessary mixing techniques at the moment to use this additive immediately. B. The number of cars running on petrol has dropped by 20% in the last 3 years. C. The essentially middle class country currently is in the middle of an economic boom, and the companies do not wish to alter the consumption patterns. D. The companies are unsure of the long term impact of the additive on the car and wish to wait for the studies to establish the safety of ‘Elixir’. E. Since the fuel additive would reduce petrol consumption, companies do not wish to lose out potential revenue. Answer question nos. 16 – 18 on the basis of the information given in the following case. Western Uttar Pradesh has seen immense rainfall in the last two weeks and there is a flood warning that has been released for the region. Considering that it has been raining non-stop for the last 18 hours, and the weather department expects more rainfall in the next 24 hours, the ravines in the region are funning full and are expected to overflow any moment. The Ganges, which flows through the region, is expected to overall, and despite sandbagging and all other efforts, flooding seems to be a foregone conclusion. The residents of the region, who are primarily farmers, have been advised to evacuate these regions at the earliest, and this means that they would have to leave behind most of their livestock and investments in their farms. The farmers are trying to save what they can and are clinging on to their land till the absolute last moment, in hope that the rain would abate and they would be able to save some of their belongings. (i) Make the evacuation of all mandatory. (ii) Issue a strongly worded advisory, though not making the evacuation mandatory. (iii) Call in the army in advance, sensing the need for possible last minute evacuations. (iv) Try to create awareness amongst people, through mediums such as radio, about the need to evacuate. (v) Make an informed guess about which areas will get flooded first and place all of one’s resources in these areas. Out of the above, which are the set of decisions of decisions that are advisable in the given case? 17. In order to make the right decision, which one of the following managerial attributes is required the most by the District Commissioner of the worst affected regions? 18. Out of the options given below, which would be the best policy decision by the government of Uttar Pradesh to ensure that people evacuate from the region as soon as possible? A. Establish alternate sources of income for people who would lose their livelihood in the floods. B. Establish camps where people can migrate to. C. Announce substantial compensation for those who would lose their livestock and other essential items of livelihood in the flood so as to incentivize evacuation from the region. D. Create a committee to oversee the evacuation process. E. Create a rehabilitation fund and ask for all other states to contribute to it. Answer question nos. 19 – 20 on the basis of the information given in the following case. You run an IT company and you have divided the IT operations team into 15 clusters. Each cluster has one head, who reports to you, and the cluster head has five members who report to him. Every year, the cluster with the best output wins the annual performance award accompanied with some perks for each of its members. Each cluster has its distinct name, generally provided by the cluster head. The ‘Dark-Knights’ cluster had performed the best during the last two years, and its head, Narayan Murthy, had also been rated as the best cluster head consistently. But this year’s results have been surprising. Even though Murthy has been still rated highly by the other cluster heads, his team is in the middle of the rankings this time. 19. Which, out of the following, could be the least likely reason for decline in the performance of the ‘Dark-Knights’? A. The cluster has had toughest projects this year, and hence, finds itself lagging in performance. B. Two vital members of the team have faced personal issues during the year, and thus have impacted the overall levels of efficiency. C. The cluster has not been able to learn on the job and have suffered from poor directions. D. The cluster-members of the last two years have been replaced and the current ‘Dark-Knights’ bears little resemblance to the teams of the previous two years. E. The cluster members were not satisfied with the perks given in the last two years and felt de-motivated. 20. You decide to sit with Narayan Murthy and try to establish the reasons for the decline in performance of his team. What came out of the meeting was that some of the members of the cluster were not happy with the kind of perks they got after winning the award for the second time last year. They felt that this was not adequate compensation for their effort and that they deserved more. Which, out of the following, is a corrective measure that can be taken by you? A. Assign new tasks to the Murthy’s team with the promise of enhanced gains if they finish the work on time. B. Provide the team some extra case incentives for their work in the previous two years, and ask them to work with dedication in future. C. Re-do the performance scheme in co-ordination with all cluster heads and make sure that demands of employees are met for next year’s performance. D. Re-assign Murthy’s team to other clusters so that their demands peter-out. E. Increase Murthy’s salary and ask him to ensure that his team stays motivated. 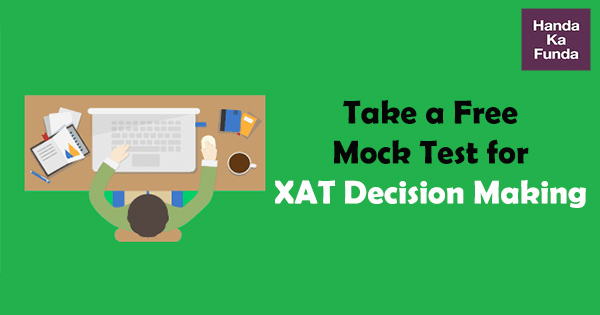 For those students who are enrolled in our XAT Decision Making course, the answers along with detailed solutions are available in PDF format in the mock test section of the course. If you think some of your friends might be interested in attending this class as well, please share this post on Whatsapp / Facebook. A great set of questions.